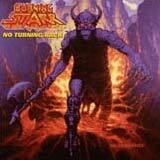 Burning Starr - No Turning Back! No Turning Back! is the second of four albums that Jack Starr released under the Burning Starr monicker back in the 80's. Of course, Jack Starr was an original member of Virgin Steele, but the man has been in more metal projects that I can keep track of; Phantom Lord, Devil Childe, the more recent Guardians of the Flame, and a number of solo albums to name a few. This album is my personal favorite of the Burning Starr albums, and arguably one of Starr's premier efforts of his career. Naturally, No Turning Back! is very similar to the first two Virgin Steele albums, but more traditional influences from bands such as Riot, Judas Priest, and even Lizzy Borden can be heard. Starr managed to put together a very solid lineup for this album. Lead vocalist Mike Tirelli, who is now with Riot, makes his Burning Starr debut on this album. He would go on to handle lead vocalist duties for the final two Burning Starr albums as well. His delivery on this album is a bit higher than his more recent work, but the intense energy and keen sense of melody were very much a part of Tirelli's repertoire back then as they are now. Tirelli mixes in the occasional falsetto, which harkens to David DeFeis a bit, but Tirelli is nowhere near as over the top as DeFeis. Tirelli doesn't push the envelopes like that, but his highly melodic delivery and passion dash each of the songs quite colorfully. The unexpected (but he definitely comes to mind for me) Lizzy Borden similarities to Tirelli's delivery are very apparent throughout. Speaking of David DeFeis, he handles keyboard duties as well as production for this album. Virgin Steele fans should not get too excited though, as the keyboard use is relatively subdued here. Only on occasion are they used for atmosphere or to accentuate the melodies, such as on the title track and the majestic anthem, Light in the Dark. This is very much a guitar driven, 80's heavy metal album. With that said, don't expect any Virgin Steele-ish lush keyboard fills to overflow on this album. Exceptions would be the all piano instrumental Prelude in C Minor and the guitar / piano instrumental Coda. Either could have been lifted off any Virgin Steele album, but Coda easily is the better track. The production is as top notch as you'd expect from this era, right on par with early Virgin Steele. While not annoyingly stripped back, the bass could have been turning up a bit in the mix, which would have really given this album a galloping, thunderous sound. A song like Call of the Wild is a perfect example of this. Still, this is a common trait of albums of the era, so it would be silly to criticize the album on that point. As for the songs themselves, this is an album loaded with fist pumping heavy metal anthems. There are some laid back hard rockish tracks mixed in as well. Again, this strikes similarity to Jack's Virgin Steele days. Road Warrior, Run For Your Life, and Fire & Rain are the "breathers" on this disc. Run For Your Life is a bit ordinary (although the lead riff and soloing toward the end are xcellent), but Road Warrior is super catchy track in the vein of Lizzy Borden, while Fire & Rain is a heavy guitar driven power ballad that gives Tirelli a chance to really shine. Aside from that, we are treated to some 80's metal anthems that won't escape your memory after just the first listen. Heavy and crunchy, yet memorable riffs are the core of the songs, while Jack is a beast with his soloing and shreds throughout the album. Mike Tirelli brings Starr's ferocious guitar work to life quite well with his melodic and powerful delivery. As I touched upon, the rhythm section gets a bit buried in the mix. Although not a thunderous sound, the bass is performed quite well, complementing Starr's driving riffs like a well oiled machine. Call of the Wild and the Judas Priest like Evil Never Sleeps are the most prominent examples. The drum work may not be the most technically challenging that you'll ever hear, but I appreciate the NWOBHM like energy that I hear pounding throughout the album. For fans of early to mid 80's traditional heavy metal in the vein of Riot, Judas Priest, and early Virgin Steele, your music collection shouldn't exclude this album. Specifically, fans of Jack Starr will find plenty to appreciate here, and I personally find it to be one of the top 2 or 3 albums of his career. Jack Starr was certainly a busy man bouncing between many bands and projects back in the day. To this day, No Turning Back remains a true heavy metal gem that may sound dated, but will never lose an ounce of its power, intensity, or lasting power.